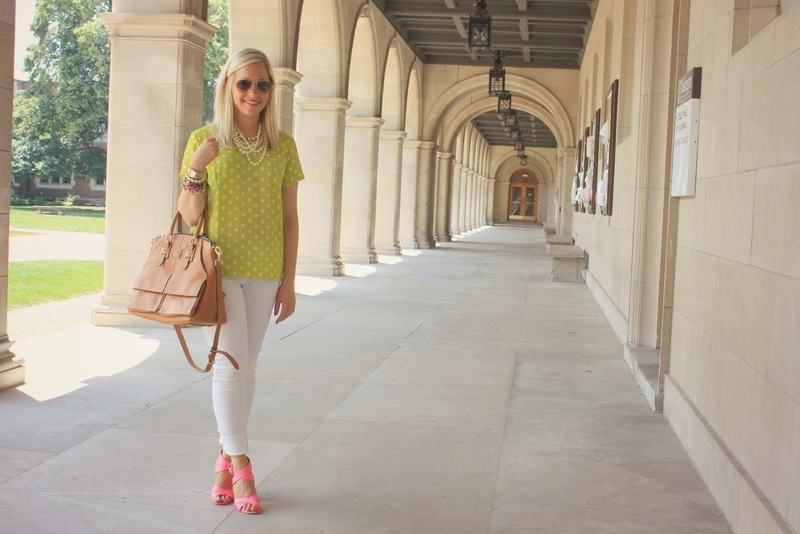 I got this polka dot top last week when I was on vacation. We stopped just outside of Boston at an outlet mall. So glad we did! J.Crew Factory had 60% off already reduced prices! I got this top for super cheap. $10.00! Love summer sales! So many going on! 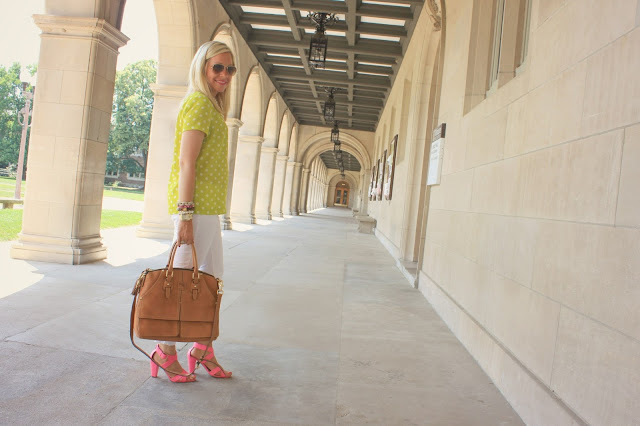 I paired it with one of my favorite shoes this summer! My dad told me yesterday that I wear these shoes all the time. I think it's funny that he notices. They are so fun and I love pink! Of course I will wear them all the time! 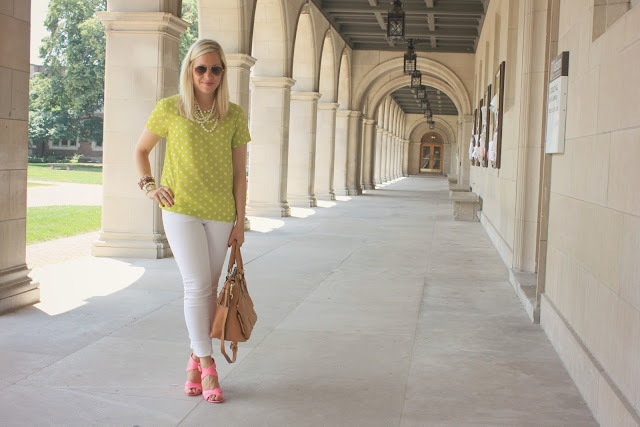 This Thursday I am hosting a linkup with the gorgeous blogger Elle from Living In Color! 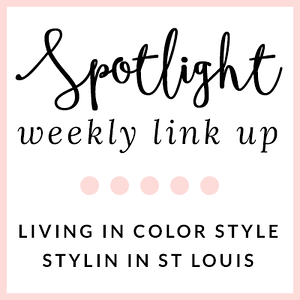 We are going to be doing "Spotlight of week" linkup. This week is Stripes! Pick out your favorite stripes looks and share Thursday! Absolutely love the mix between those colors! You look amazing! Thanks Patricia! You are so sweet! Can't believe that darling top was just 10 bucks! I'd wear those shoes all the time too...they are gorgeous! Thanks Sharon! Love great deals! I love those shoes! So cute! LOVE the color of your shirt :) Also, how funny that your dad noticed how frequently you wear those darling shoes! lol I think it's so funny when my husband or grandpa comments on my hair or outfit pieces, lol we don't expect them to notice things like that. The Spotlight Weekly button looks GREAT! 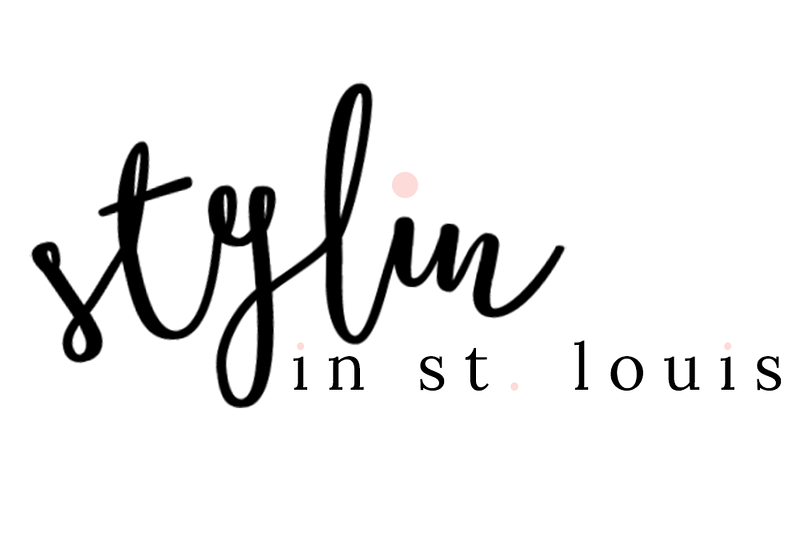 Also, you're too sweet to add my button to your blog- you've gotta get a Stylin' in St. Louis Button so I can add it to mine! :) I've been spreading the word about our link-up. can't wait, girl! I need to make one! On my to do list! So excited about our link up Thursday! That top is the CUTEST, and I love the color with the pink sandals! Thanks Annie! Love these shoes! Haha! I don't think my dad has ever commented on me rewearing shoes - ever. :) They are super cute, though, and very memorable! Thanks Kahana! Love these shoes! Love this outfit combo! The top is amazing. So so cute! I have the sandals from last year that are similar and I am obsessed with them. They just go with everything! Your J. Crew factory experience makes me really excited because we are getting one near us soon! Such a cute top and what a great deal! Can't wait to link up on Thursday! So exciting! We are getting one in St. Louis soon too! So exited that you are linking up! $10 is such a steal for that top! I love it with the pink heels. You look great. Thanks Lauren! Love great deals! you look amazing and very summery. 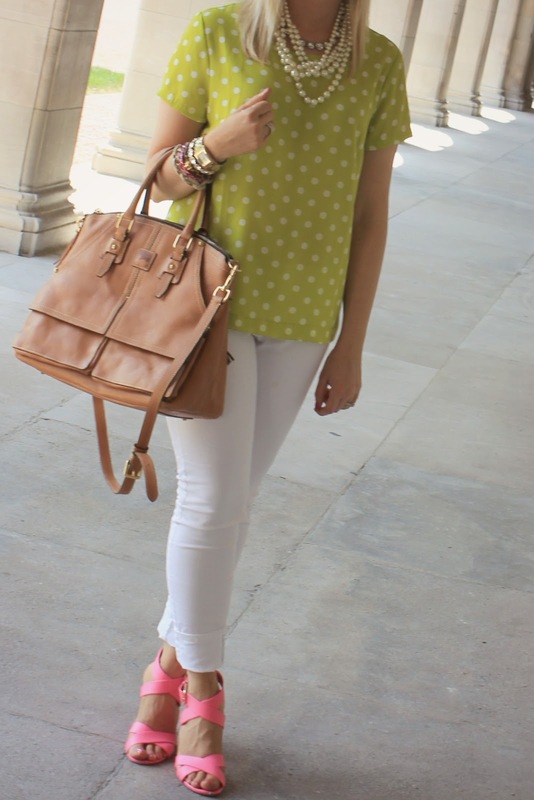 I am absolutely in love with your polka dot top. Thank you! Love this top! Such a cute outfit Jacqueline!! You look amazing in yellow! Thanks Katherine! You are so sweet! So cute! I love the mix of colors! I feel like everyone has these shoes but me! Not fair! Lucky you! I went to a J. Crew Factory recently, but everything on the sales rack was either XS or XL (not my size). Ho hum. Super cute look for you! Thanks! I am usually unlucky when I got shopping on sales when they started weeks before. I got really lucky this time. Hope it happens again! Found you via Sandy Ala Mode. I love this outfit esp those pink heels. I will be back, great style! Such a lovely top! Love the contrast of colors from your top with your shoes :) Pretty, as always. Thanks Abby! Love pink and green! This outfit is gorgeous! Summery perfection. I cannot believe the shirt was $10! And I love those shoes! How cute that your dad notices that you wear them all the time. My dad would never notice and/or mention such a thing! I would love to feature this look on our blog tomorrow. We will be sure to link back! Thank you! My dad always looks at my clothing choices. So funny! Thanks for featuring me on your blog tomorrow! I would love it! Super cute outfit! I'm so glad I came across your blog -- you're the first blogger from here in St. Louis I've found!! $10?! I love J. Crew Factory.